Posted on March 13, 2014 by Steve Kruschen, "Mr. Gadget®"
Read the how and why about this list from the top of the #10 post, then come back to read about Haley’s Corker. Haley’s Corker – What else could such a product be called that is invented by a woman whose last name is Haley? In my own group blind taste tests, everyone agreed that red and white wine poured through Haley’s Corker tasted better than without. Period. Sure, other “aerators” abound with new ones coming to market every year. I’ve tested others, most of which cost significantly more. All the others I’ve seen are more cumbersome to use and clean, and much less functional. Why bother with others and pay more for NO functional benefit? 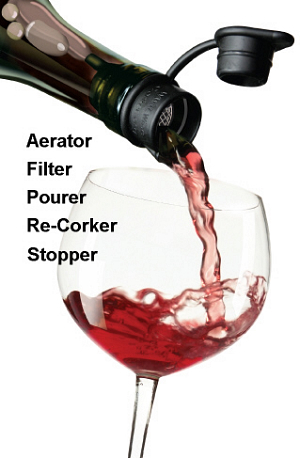 Haley’s Corker is a 5-in-1 product that produces immediate positive, taste-improved and -enhanced results pouring wine, liquor, even champagne (after the first glass is poured). Screw-capped wines also taste better. In addition to drip-free pouring, corking, capping and side-storing positives, Haley’s Corker works exceptionally well with cooking oils, vinegars and soda. Who knew? Alcoholic beverages benefit from the taste that aeration provides and the design’s screen traps debris and sediment that may otherwise flow into the drinking glass. The pouring edge produces drip-free pours and the snap-tight cap keeps wines and other beverages tasting good longer. That cap also allows side storing without leakage. Take that, those of you who try to re-cork using the original cork! Made from a proprietary, FDA-approved, BPA-free, dishwasher safe medical grade plastic, this USA-made product is all that is needed for an enjoyable, trouble free experience unlike that of any other product of its category. The plastic neither introduces nor retains odors or tastes or any kind. Talk about a great gift idea for so many occasions and in so many colors! Haley’s Corker gift-set pairs come in bags of shimmer organza and tiny, shiny satin ribbon tie-off ends for about $15 and go up in price with more Haley’s Corkers in the set. www.winecorker.org.